Consistent with our position to stand with the lumad people and join with them in their journey for self-determination and defense of ancestral lands, we in the Iglesia Filipina Independiente (IFI) vehemently condemn the recent military operations conducted by the Armed Forces of the Philippines (AFP) under the 75th Infantry Battalion Philippine Army (IBPA), 36th IBPA and 6th Special Forces Battalion against the lumad people that resulted to massive forcible evacuation of around 424 households with 2,047 individuals from nine (9) lumad communities in Lianga, Surigao del Sur on July 6, 2017. Evacuees reported that the military operations in their communities begun on July 3, 2017 implementing stricter checkpoint placed in front of the military detachment requiring residents and visitors to the schools to show their ID or write their names in a logbook in accordance to Martial Law declared by President Rodrigo Duterte last May 23, 2017. In the middle of the night of July 5, 2017 a bomber plane was seen circling their mountain communities which prompted them to forcibly leave their homes out of fear that the aerial bombing which happened in Marawi will happen in their communities. The evacuees fled also in the fear that the September 1, 2015 massacre will be repeated. We recall that two years ago, this massacre led to the death of Dionel Campos the Chairperson of Malahutayong Pakigbisog Alang sa Sumusunod (MAPASU), Emerito Samarca the Director of Alternative Learning Center for Agricultural and Livelihood Development Inc. (ALCADEV) and Bello Sinzo, a Tribal Datu. While the evacuees are currently staying at the Simowao Tribal Community School located about 9 kilometers from the national highway and Poblacion of Brgy. Diatagon they received reports that gun shots were heard in the communities where they left. Several details more are alarming to us. 1). The bomber planes were hovering over the mountains of Lianga, Surigao del Sur on the night of July 05 only a day after the Supreme Court upheld the Martial Law. We fear that this might have emboldened the more the AFP troops to conduct military operations in the community. 2). Church people who responded and brought relief assistance for the evacuees were harassed at the military checkpoints and were restricted to go through. Some clergy were interrogated and photos of them were taken. 3). There are presence of paramilitary elements at checkpoints which cause fear to the lumads given the fact that the killers of their massacred leaders in 2015 were paramilitaries. 4). A total 633 lumad learners were affected with the suspension of classes due to the evacuation. Their collective right to education is violated. The IFI stands with the Lumads in condemning these acts of human rights violations against their communities. 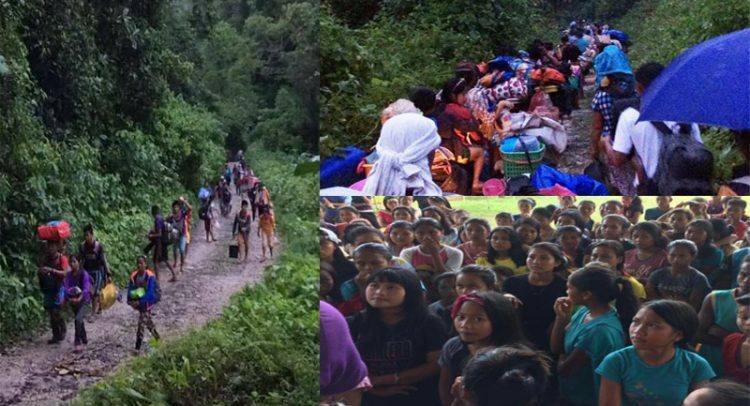 It must be remembered that these communities still nurse the trauma of the 2015 Massacre and it is only ten months upon return to their ancestral lands and they are still in the processes to rebuild their lives, communities and livelihood. But now they have to evacuate again due to military operations, this time in the context of the much feared Martial Law. It is worth noting that since the declaration of Martial Law on May 23, 2017, countless human rights violations cases like extra-judicial killings, forcible evacuation, aerial bombardment, indiscriminate bombardment, destruction of properties, divestment of properties, illegal arrests and detention, threat-harassment-intimidation, and more have been documented by rights groups and the documentation still continues in Marawi, Maguindanao, Davao del Sur, Agusan del Sur, Compostella Valley and elsewhere in Mindanao. We fear that the Supreme Court ruling will only result to a rise in human rights violations particularly against Moro brothers and sisters, lumads, and peasants. We therefore call for President Rodrigo Roa Duterte to lift the Martial Law because it will only add more problems than solutions. It will certainly breed more human rights violations against the people all over Mindanao. We urge instead President Duterte to focus all efforts in the peace talks and the signing of the Comprehensive Agreement on Social and Economic Reforms and the rest of the substantive agenda towards the attainment of a just and lasting peace. We call to stop militarization of lumad communities! Uphold children’s right to education! We also call all the IFI clergy and faithful to exert all effort in order to respond to the humanitarian needs of the evacuees and work hand in hand with other churches so that the good news of salvation will be preached in these worst of times.